The majority of SMEVA counters which we install have humidification systems incorporated into their design. This system helps increase product profitability through reduced product de-hydration, boosting the retailers profits. Phoenix Retail have been servicing misting systems for over a decade. Our service team operate nationally across the UK - providing a call out service and pre-planned maintenance (PPM) visits. We are also proud to have a long lasting relationship with humidification OEM Miatech. This gives us the capacity to install our own misting systems. Shown (left) you can see images from Amery Court Farm, in Kent, where the Miatech misting system was installed at high level in a glass house used for growing raspberries. 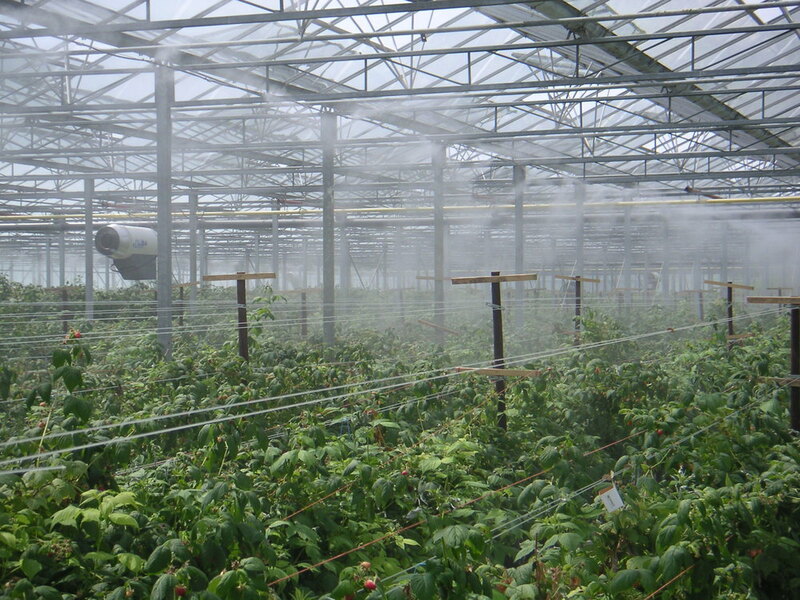 The misting performed three functions, it raised the humidity which as beneficial to the plants, it defused the sunlight reducing the scorching to the top of the plants and it reduced the temperature during the hottest part of the day.